Bonelli’s eagle (Aquila fasciata) occurs patchly in the Paleartic and in the Indo-Malayan regions. In Italy the species breeds in Sicily, whereas it is more scattered in Sardinia and rare and irregular in Calabria. It is locally uncommon or rare and declining throughout its range. 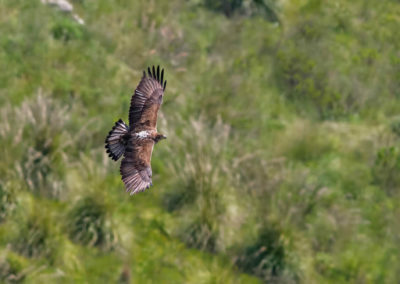 Bonelli’s eagle is a sedentary species, although young individuals can spread over distances exceeding 200 km. 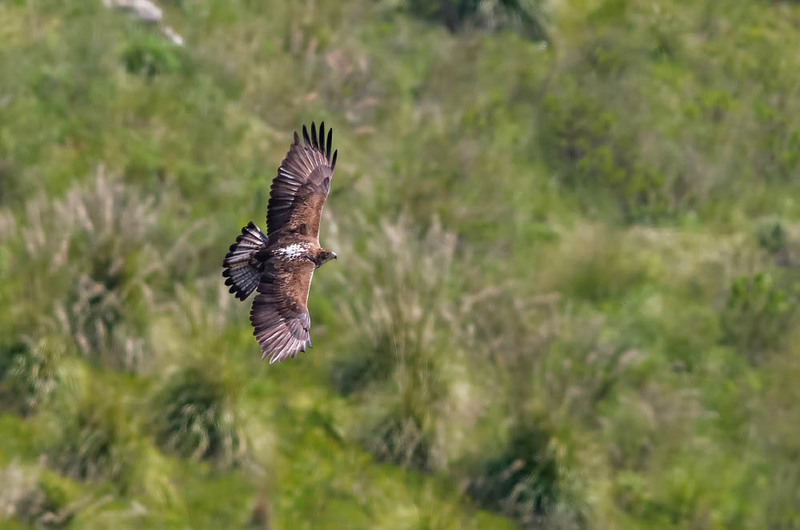 The species is found mainly in mountainous and rocky habitats, from sea level to 1,500 m, which may become 3,000 in Africa and 3,750 in the Himalayan region. 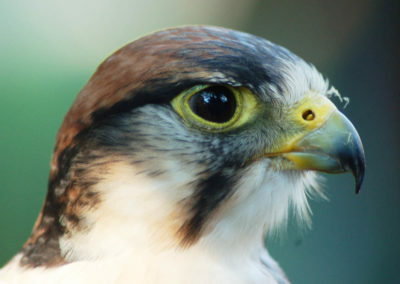 Its diet mainly relies on medium-sized birds but it also includes mammals, reptiles and insects. Occasionally, it can feed on carrions. The nest, made of twigs, can be up to 2 m wide. 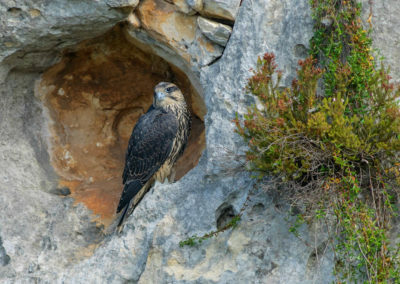 The nest is usually placed on the ridge of a cliff or within large trees. The reproductive season occurs in January-July in the western part of the range and in September-November elsewhere. Since the fifties, the species has suffered a relevant decline throughout its range, mainly due to the uncontrolled use of the pesticides. 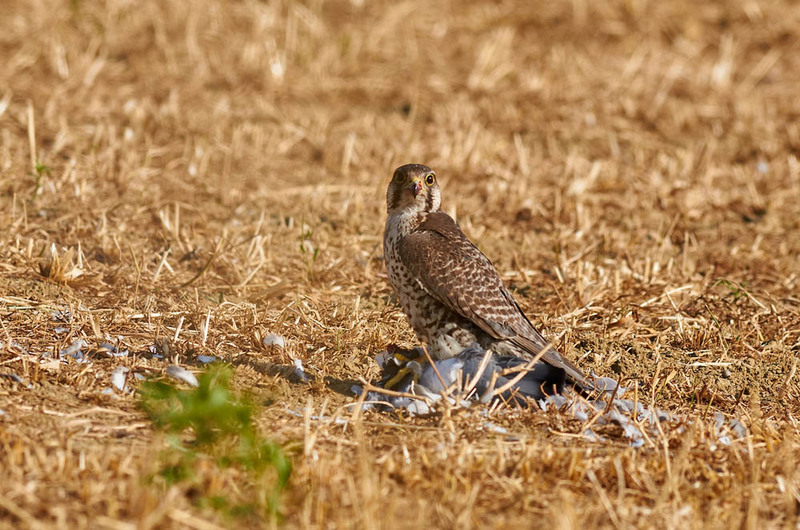 The reduced prey availability, the increasing anthropogenic pressure, electrocution, bird and egg collection at the nesting sites and the intense agriculture are the drivers of the species decline. 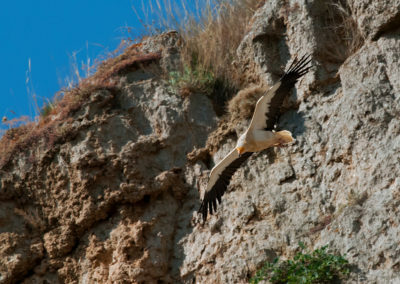 The Italian population is relatively small, with the nesting pairs occurring only in Sicily, where about 44 mature individuals are estimated to occur. 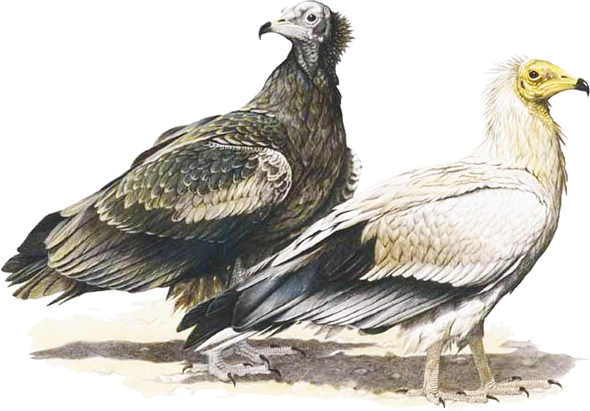 The species is currently threatened by: habitat degradation, anthropogenic pressure and illegal collection of eggs and nestlings. 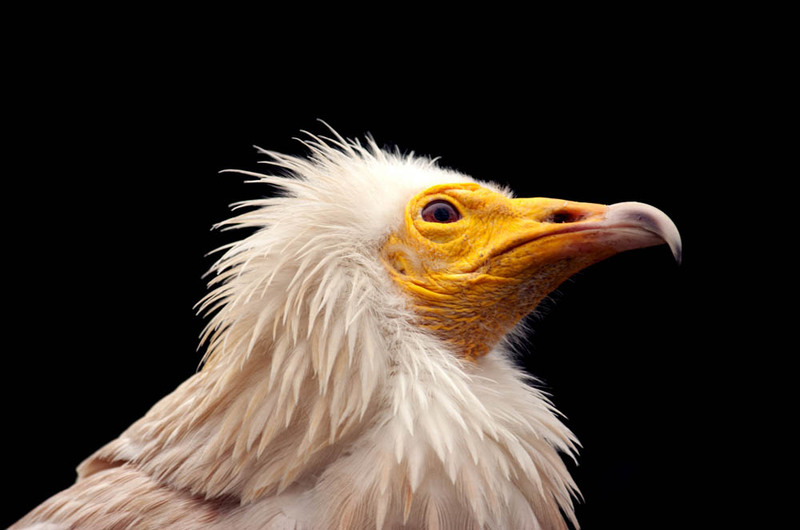 In the Lista Rossa delle specie italiane the species is classified as Critically Endangered. 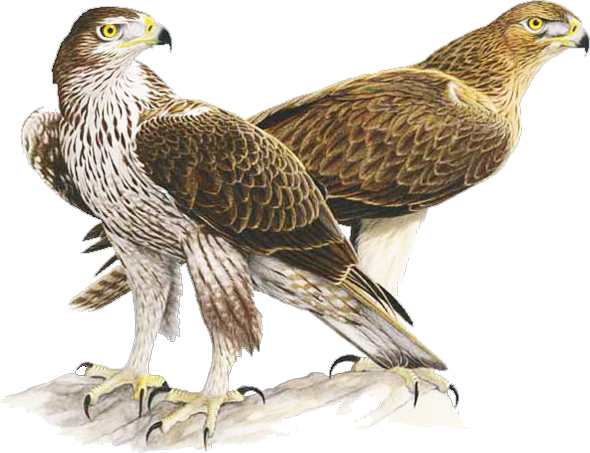 The species is listed in the Annex I of the EU Birds Directive. The Egyptian vulture (Neophron percnopterus) occurs in a wide region, including Mediterranean Europe, Northern and Central Africa, Asia. 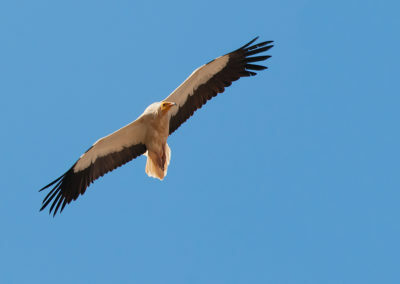 In Italy it is a migratory species, breeding in Sicily, Calabria, Basilicata and occasionally in Apulia. About 65% of the breeding population occurs in Sicily. 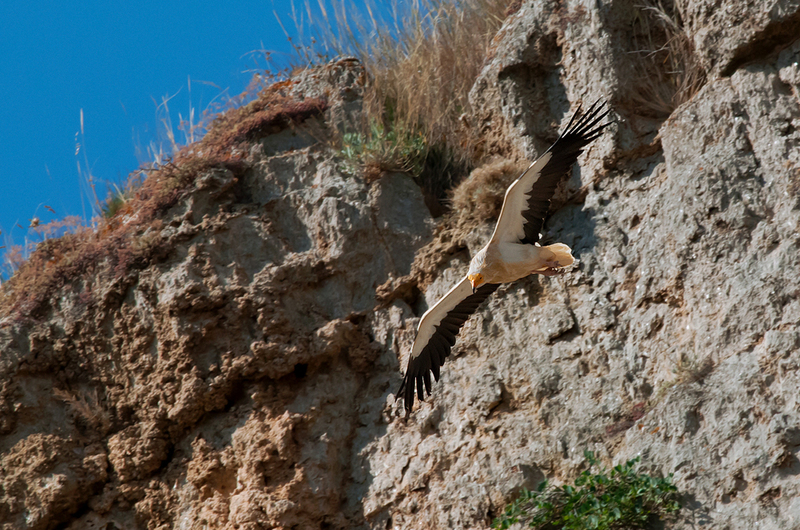 The Egyptian vulture builds the nest along the ridges of the cliffs or in caves in the rocky cliffs. Occasionally, the nest can be found on large trees, buildings, pylons and more rarely on the ground. Forages in lowland and montane regions over open, often arid, country. Also scavenges at human settlements. The diet is wide and includes carrions, turtles, organic waste, insects, small vertebrates and eggs. 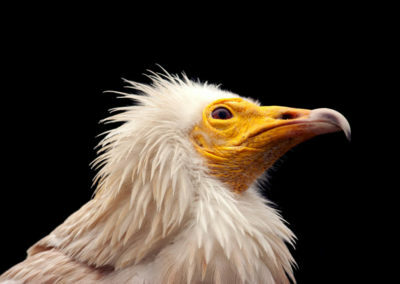 The Egyptian vultures occur as solitary individuals, but can aggregate at the feeding sites. 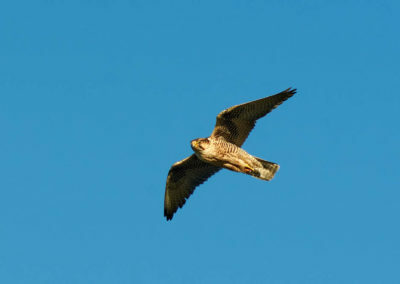 The breeding individuals undergo long migratory trips. This species faces a number of threats across its range. Disturbance, lead poisoning (from gun shot), direct poisoning, electrocution (by powerlines), collisions with wind turbines, reduced food availability and habitat change are currently impacting upon European populations. It appears that Diclofenac, a non-steroidal anti-inflammatory drug often used for livestock, and which is fatal to Gyps spp. when ingested at livestock carcasses, is driving the recent rapid declines in India. In the Italian Red List the species is classified as Critically Endangered. 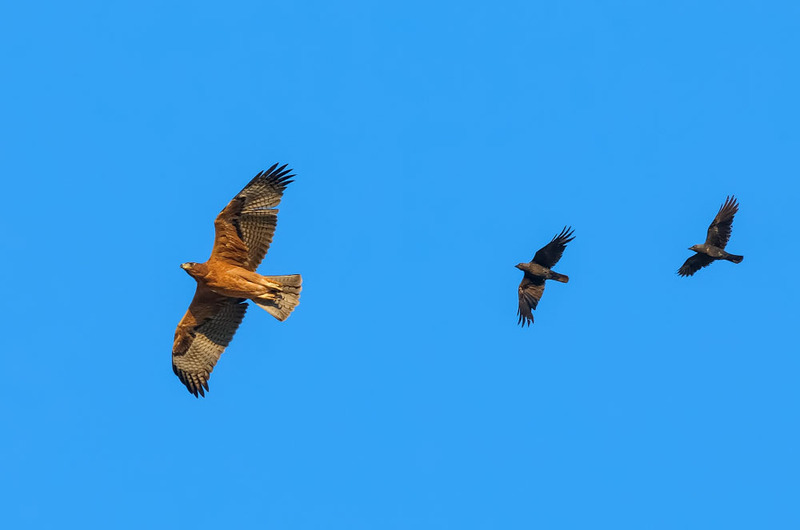 The main threats in this country are: changes in the agricultural and livestock raising practices, illegal killings, pesticides and poisoned baits (used against carnivores) and wind turbines. 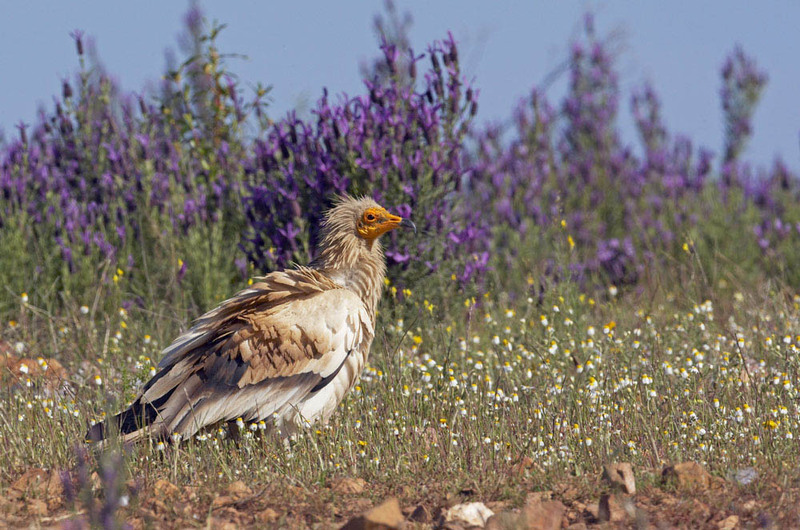 The Egyptian vulture is listed in the Annex I of the EU Birds Directive. 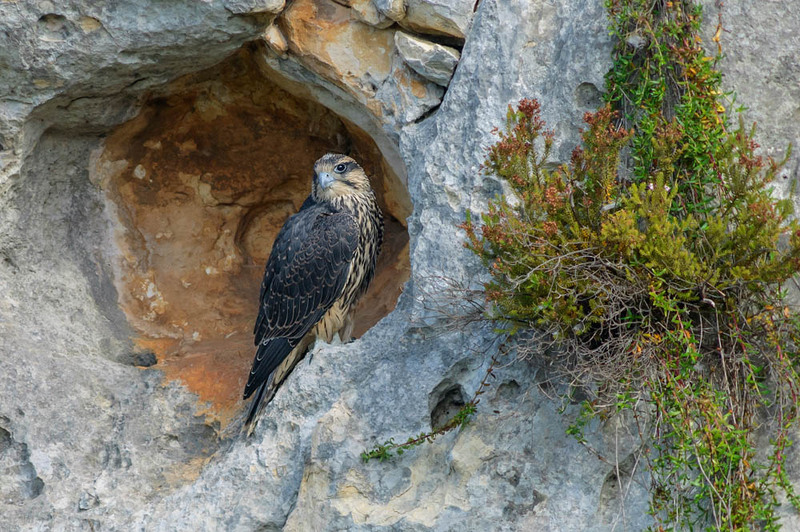 The Lanner Falcon (Falco biarmicus) occurs in Southern Europe, Western Asia and Africa. In Italy the species occurs from the Appennine to Sicily, whereas 70-80% of the population is found in the island. Lanner Falcons are found solitary or in pairs, but up to 20 individuals can aggregate at the feeding sites. It lives in a wide range of habitats: from the arid plans to the mountain forests; it has been recorded up to 5,000 m above the sea level. 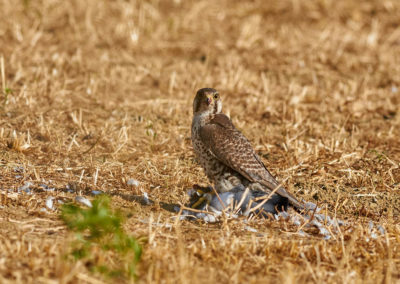 It mainly feeds on small birds, like quails, pigeons and doves, but it can integrate its diet with invertebrates and insects. 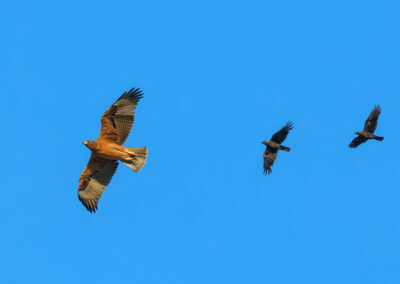 In Italy the population is estimated at 140-172 pairs. The population is declining (20% over 12 years). It breeds in hilly and grassy habitats with rocky cliffs. 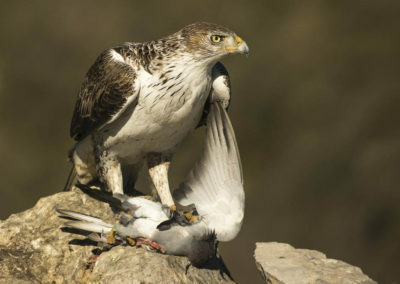 Birds usually use the abandoned nests of other raptors, corvids or herons on trees and pylons. 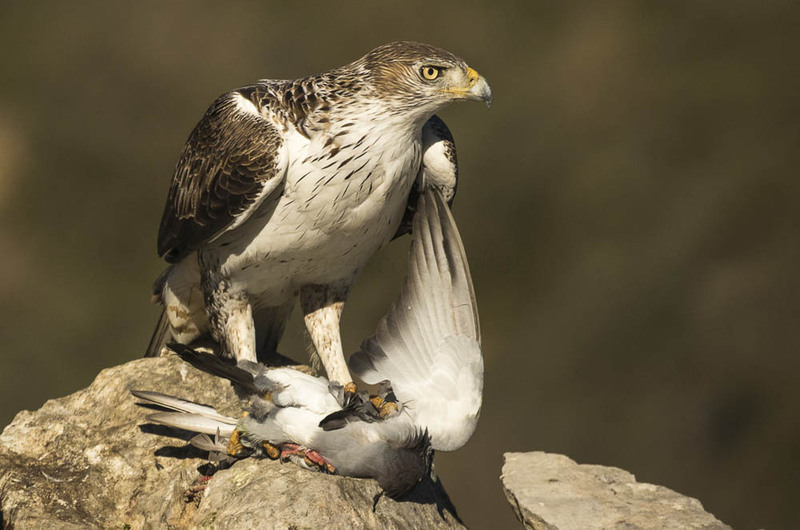 In Italy the major threats are: habitat loss and degradation and illegal killings. 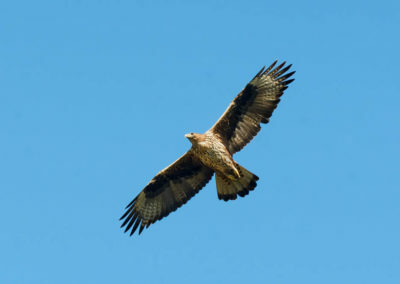 In the Italian Red List the species is classified as Vulnerable. 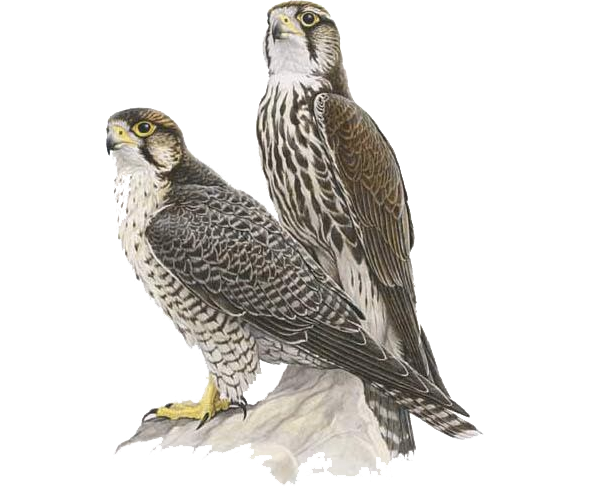 The Lanner Falcon is listed in the Annex I of the Birds Directive.